Traditional gold wedding rings are part of the worlds most popular ceremony - the wedding ceremony. Although every country and culture has its own set of unique rituals and customs and the symbols used to mark each occasion vary by culture and country. But one tradition that takes place all over the world is the wedding ceremony. No matter where the ceremony takes place, traditional gold wedding rings are usually exchanged. Gold wedding rings have come to symbolize the joining together of two hearts and two lives. And couples all over the world spend a lot of time searching for the perfect wedding rings, usually made of gold. Just so you know, gold can be yellow gold or can be white gold. It's just a preference that each person can make. The decision for a gold ring is not a task to be taken lightly. After all, if all goes well, the wedding rings will be worn for a lifetime. Gold wedding rings are as diverse as the couples that wear them. Some couples prefer diamonds, while others prefer rubies or sapphires. One bride may opt for a solitaire diamond on a plain white gold band, while another may opt for a yellow gold band topped with a princess cut emerald. There’s something to appeal to the tastes of each bride and groom. But, gold wedding rings find a top position in most cases. Gold wedding rings (both white gold and yellow gold) are very traditional. They have come in and out of vogue, and are currently the most popular wedding ring choice. Although silver and platinum wedding rings have grown in popularity, traditional gold wedding rings are used more often. They are available in a wide range of styles depending upon the design and the composition of the gold (a ring can be white gold or yellow gold). For example, you can even choose to have plain gold wedding rings. Or you can have them inscribed with names, dates, or other significant information. Gold is a soft metal, and generally other metals are mixed in it so that it becomes much stronger. Depending upon the composition of the gold, gold wedding rings can be further sub-divided into rings of 10kt to 24kt. However, 24kt weddings rings are the most expensive, as they are made from pure gold but are not durable and not popular. Pure gold isn’t necessarily the most long-lasting gold due to it's softness. As stated above, gold is a soft metal. That means a ring made from 100 percent gold, is softer than one mixed with other metals and are almost never made because the metal is too soft. 14k gold wedding rings, on the other hand, are much more inexpensive, are able to withstand every day wear and tear and are affordable for most people. Also, these are normally stronger than pure gold wedding rings because they’re mixed with metals that increase their strength. But, due to the addition of other metals, the color of these rings will fade away over a period of time. That is why most people prefer to buy gold wedding rings and have them rhodium plated to keep their color. Gold wedding rings are a marriage tradition that probably will never leave us. The symbol of love that a gold engagement ring or gold wedding brings if very powerful and strong. With so many style and price options available, anyone who wants a gold ring can find the perfect one. It can be a simple, pure gold band, or a dazzling white gold band accented with diamonds. The choice is yours. If you’re interested in gold wedding rings, set a budget before you begin the shopping and then give us a call. 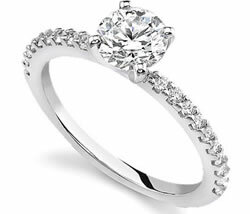 At Novori Jewelry we specialize in traditional gold wedding rings and can find one for any budget. Just call us toll free at 1-877-877-4141. We are ready to help. Then you and your partner will have a much easier time making a decision.